Anyone who was in Seattle ten years ago remembers the dramatic moment when the American labor movement joined the battle for fair trade–along with faith groups and activists for the environment, family farms, human rights and consumers. There we were at Fourth and Stewart, watching the police try to break through the lockdown at the Seattle convention center as 20,000 labor union members approached the battle zone. The unions marched behind banners, flying their colors like the cavalry. Then the march marshals, in red vests with megaphones, turned the parade around. That wasn’t supposed to happen–the unions were supposed to walk up to the convention center and, on a secret cue, sit on the ground and continue chanting. Perhaps someone in charge thought the melee in the streets was too dangerous. So the rest of us used our own megaphones: “Join us, c’mon! Now! You!” Some did, then more. The rank and file broke from the retreating parade and joined the fray. Shoulder to shoulder, Teamsters marched with Turtles, Steelworkers and anarchists, students and Wobblies. And the whole world was watching. We were amazed. And as we all remember so well and reminisce about so readily, that day changed the anti-corporate globalization movement too. It brought together the fair-trade tribes as never before, way beyond the parallel lines of opposition to the NAFTA agreement seven years before. Things have changed since then. I now work with the Teamsters, whose members I’m proud to represent in the other Washington. We are working with Congress and the new administration to design a pro-worker, pro-environment trade model to replace the flawed and failed model that has cost so many American jobs. In the intervening years, the “Seattle coalition” has suffered some setbacks–losing the fights against CAFTA and permanent normal trade relations for China come to mind–but on the whole we have filled the political space we created in the tear gas and drizzle a decade ago. Decision-makers and opinion leaders no longer talk about “side agreements” on labor and the environment, for example, and each year more and more candidates for federal office run and win with labor’s support on economic populist platforms, especially fair trade. 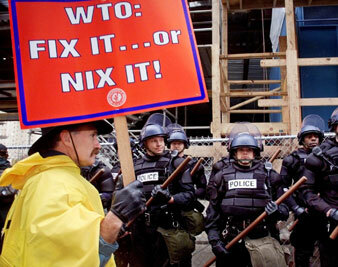 Labor should continue to lead the effort to reform global trade rules in the tradition of the Battle of Seattle, the actions in 2000 against the International Monetary Fund, the 2003 demonstrations against the Free Trade Area of the Americas, in Miami, and the recent blue-green protests in Pittsburgh. § most of all, we must keep the Spirit of Seattle alive as we work together for economic and environmental justice around the globe. Mike DolanMike Dolan, a labor lawyer and a charter organizer of the Seattle protests, lives in Washington, DC, where he lobbies for fair trade on behalf of the Teamsters.